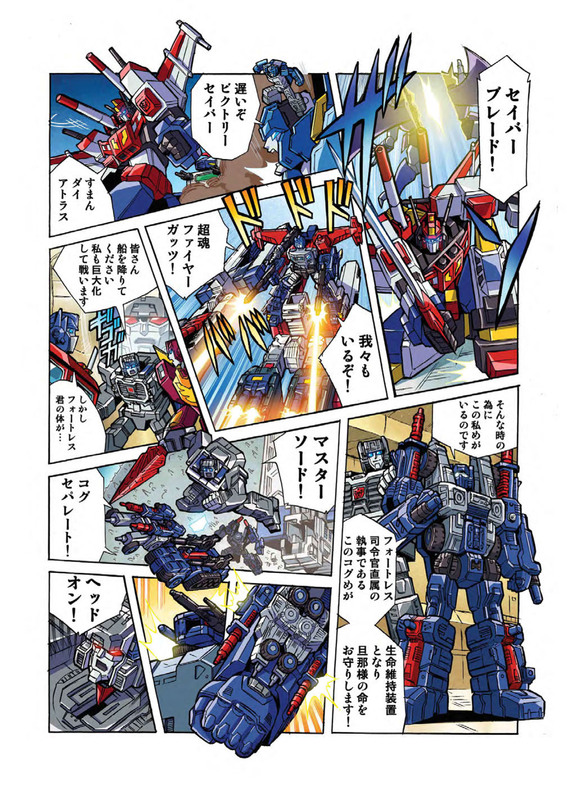 Takara Tomy Mall Website have uploaded the pdf files with their Takara Tomy LG-EX Big Powered Web Comic/Manga #4 & #5. 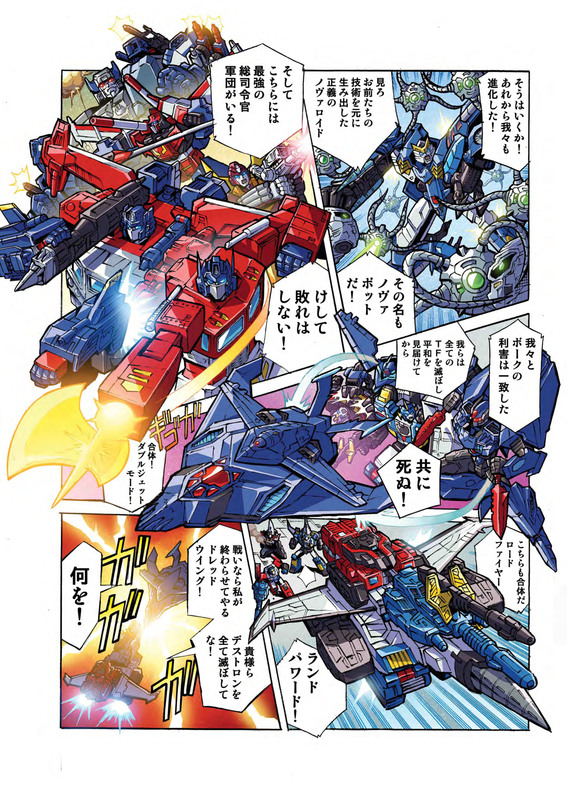 LG-EX Powered Masters Dai Atlas, Sonic Bomber and Road Fire. 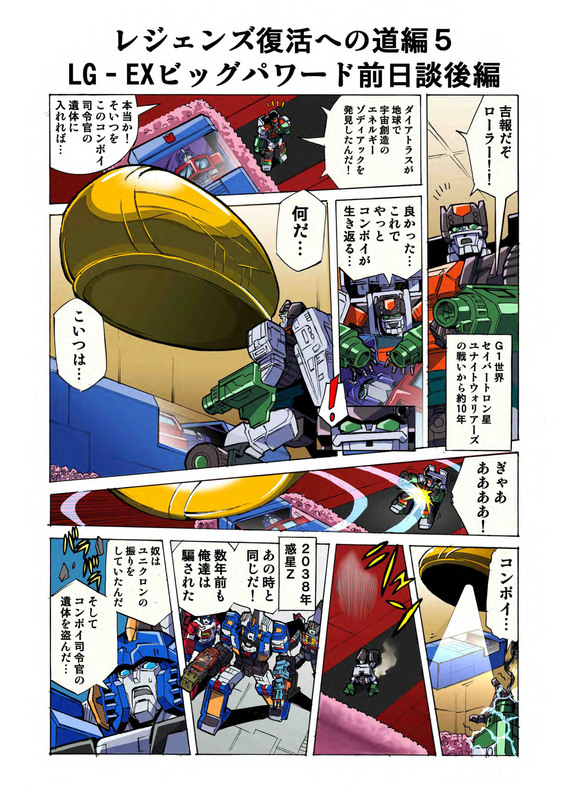 An evil G1 toy version of Dai Atlas is presented as one of the villains. 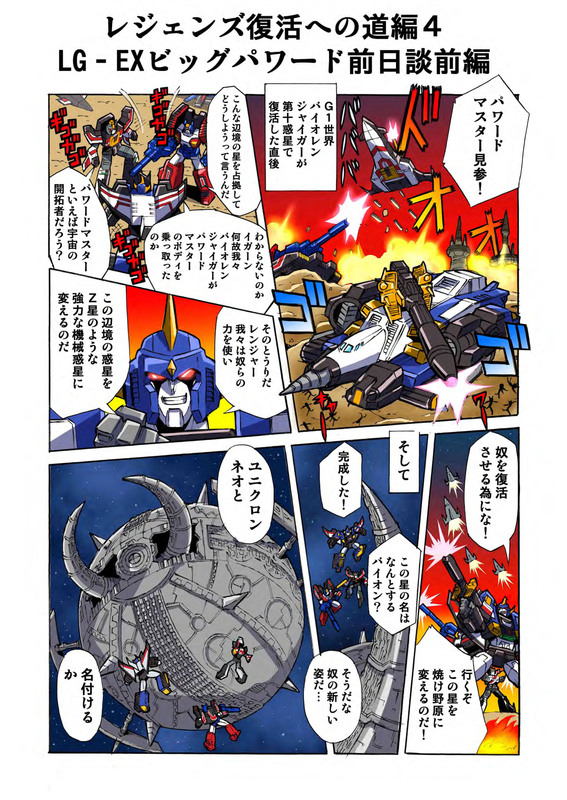 Unicron. The chaos-bringer comes in gray and modeled after the unreleased Beast Wars Neo prototype toy. 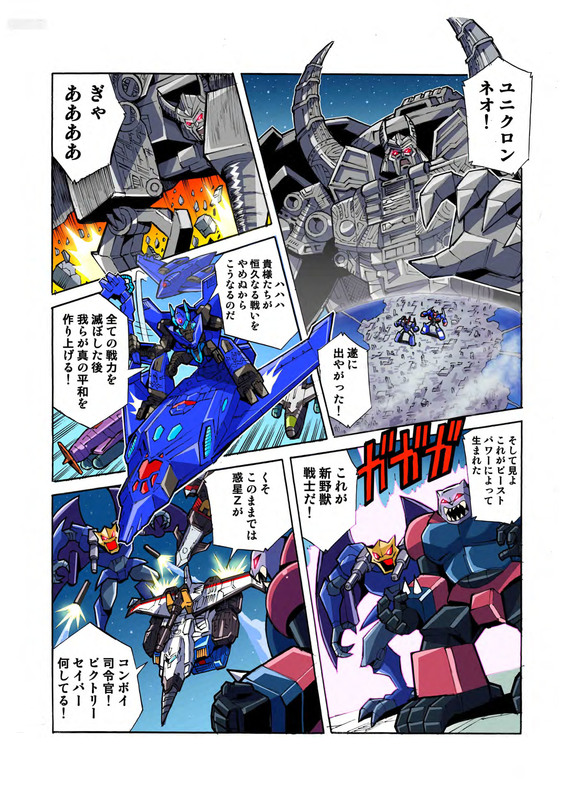 G2 Dreadwing and Smokescreen. Later upgrades into their Tokyo Toy Show 2010 exclusive toy design. Metrotitan. 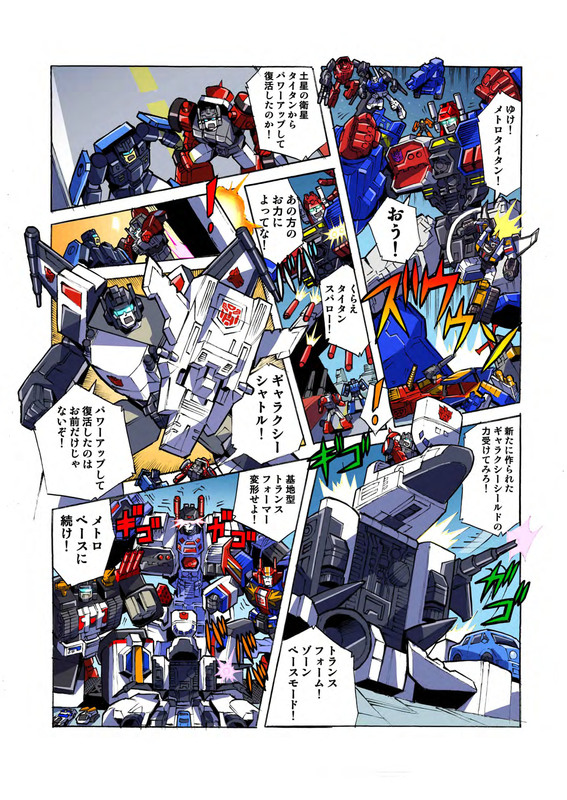 Repaint of Generations Metroplex. 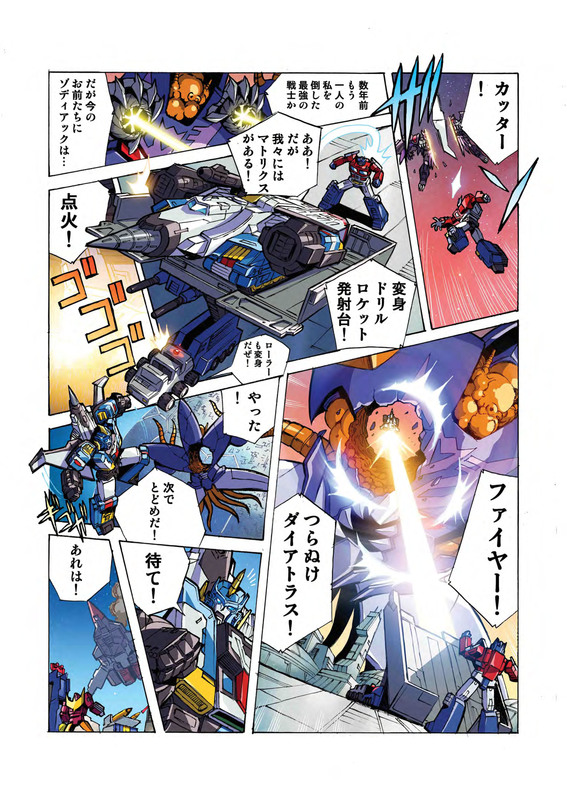 G1 Japan Sky Garry, Grandus, God Ginrai, and Victory Saber. 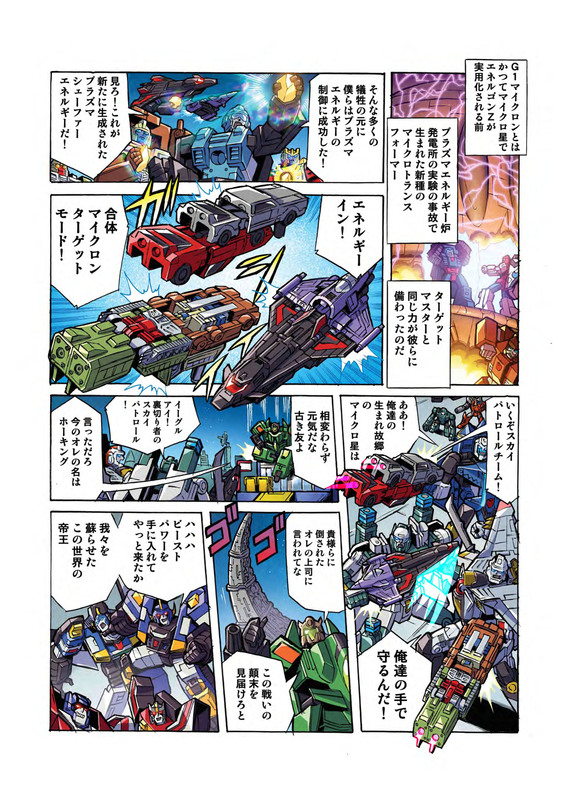 Siege Micromasters Topshot & Flak, Storm Cloud & Visper, and Roadhandler & Swindler. 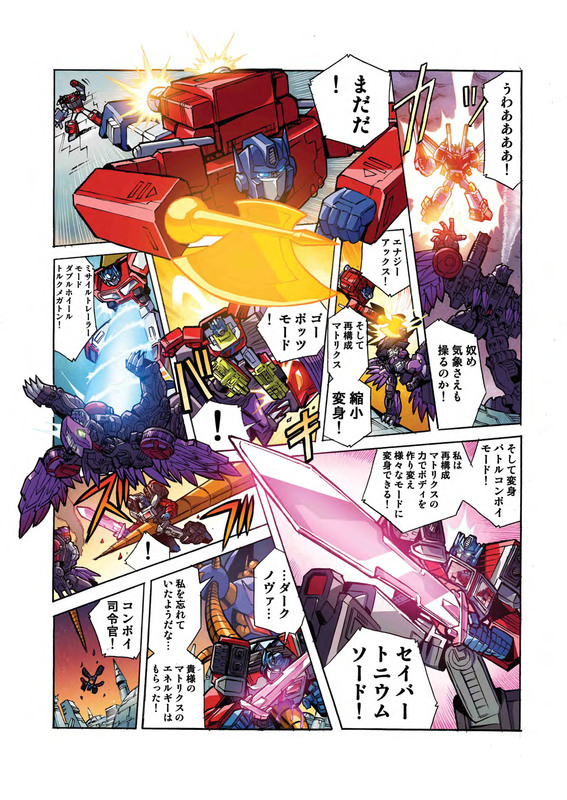 All swowing off their combined weapons modes. Siege Cog. 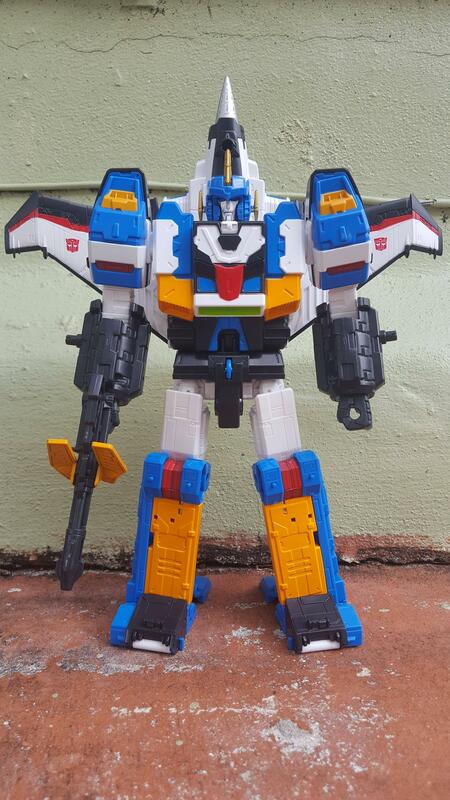 He is shown combined with Fortress Maximus for super extra fire power! 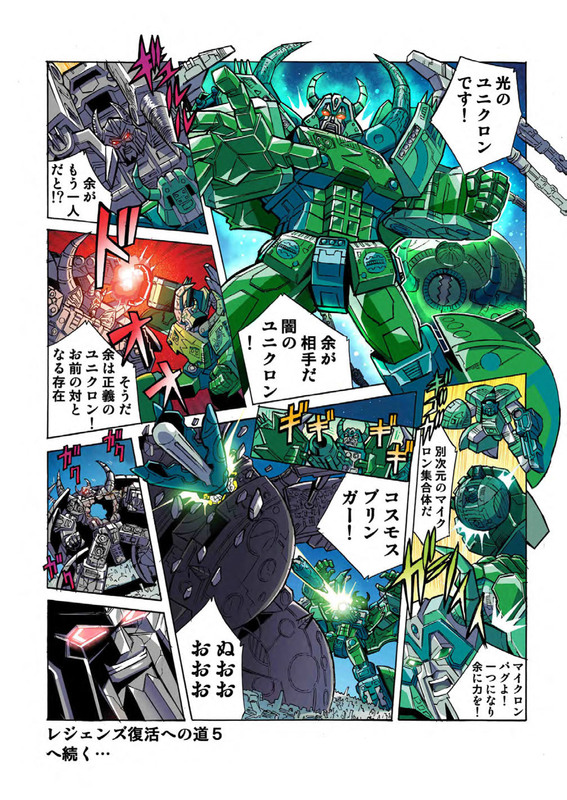 Armada Thrust and Green Unicron. Unite Warriors Roller. 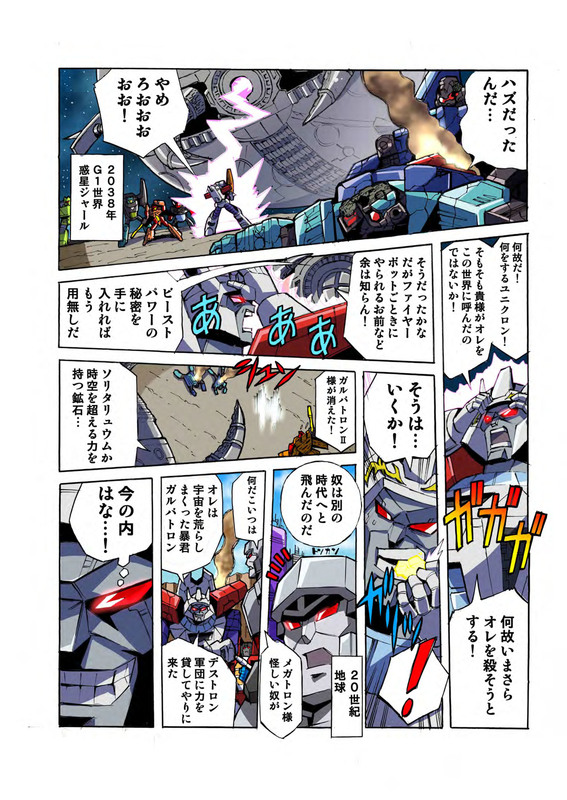 Connecting other previous LG-EX Manga issues. Dark Nova. 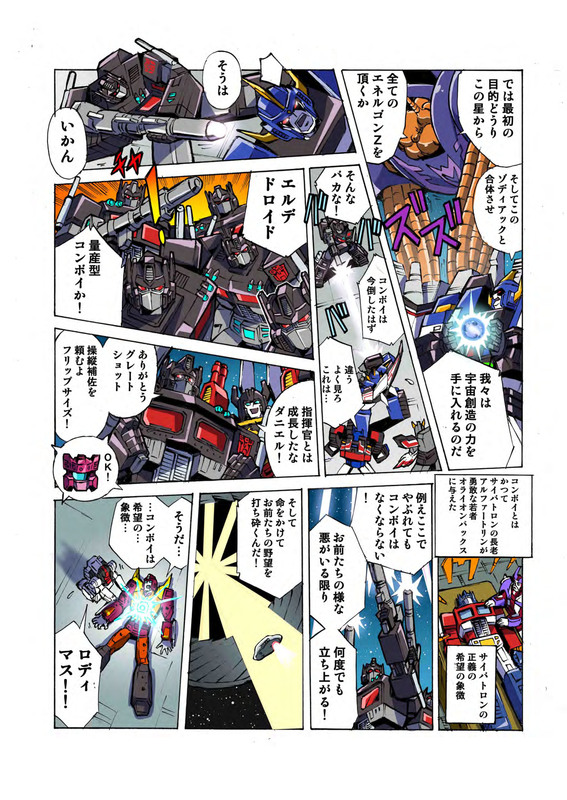 The mysterious supernatural entity who was the main villain in the Japanese Return Of Convoy story. 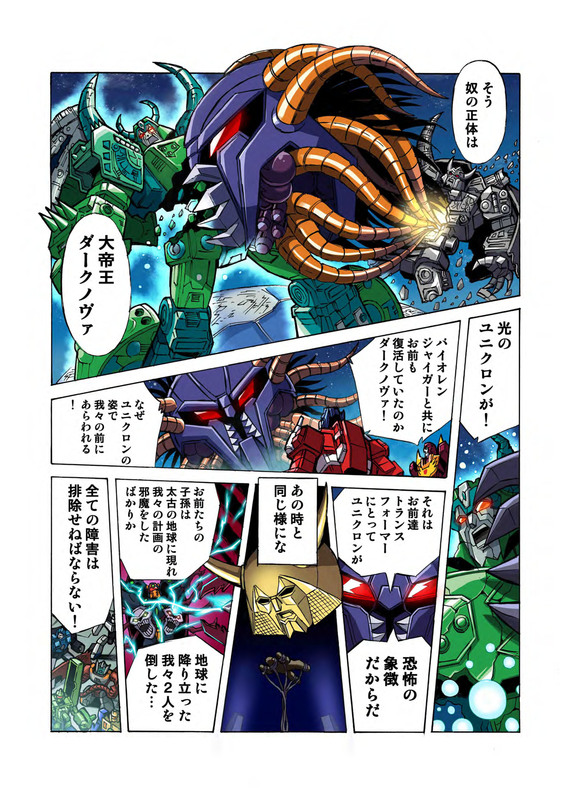 It seems to be connected or related to The Vok from Beast Wars cartoon. Transformers Universe Razorclaw. 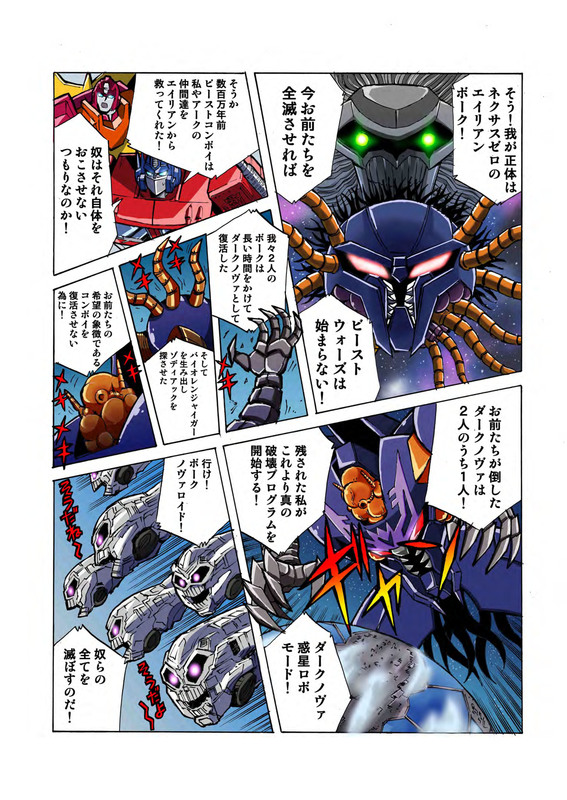 The purple redeco of Beast Wars Tigerhawk is another evil character on this story. 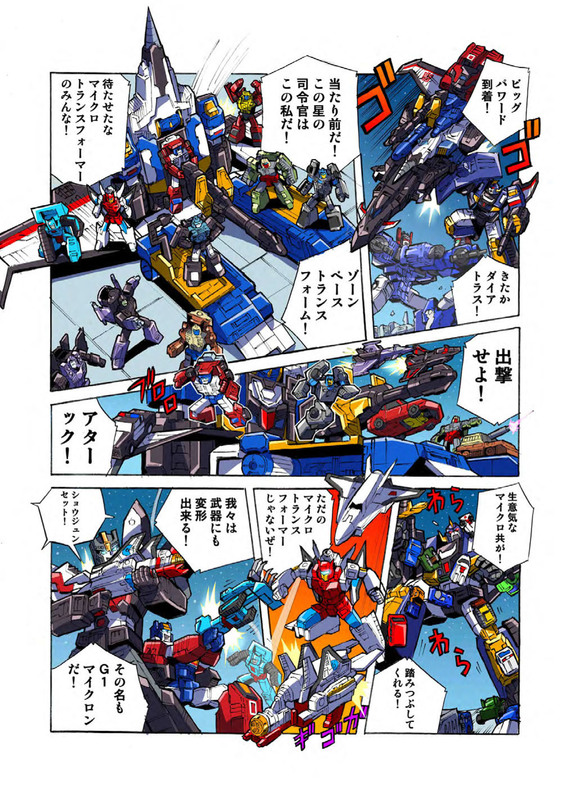 G1 Convoy is transformed into Star Convoy. 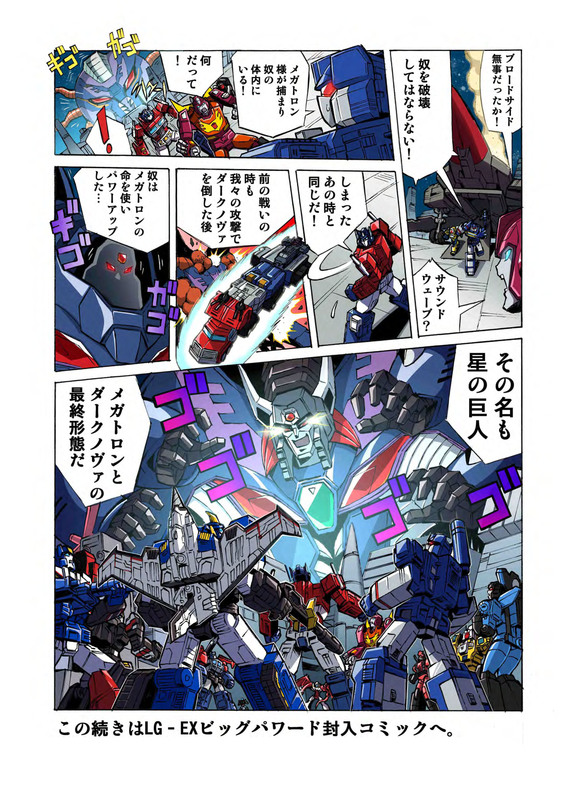 A hint that the upcoming Star Convoy mold seen at Wonder Festival 2019 could be an extensive remold of the Power Of The Primes Evolution Optimus Prime. 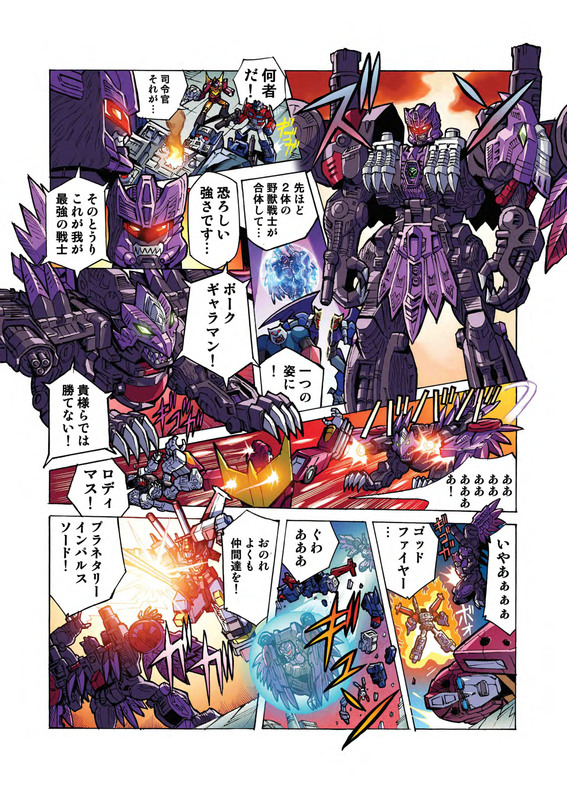 Star Giant, the final form of Dark Nova Combined with Megatron. You can download the respective pdf files here and here, or you can alternatively check out the 24 mirrored images after the jump. Don’t forget to share your impressions on the 2005 Boards! Even if they kept the mechanism 100% as is, if they had just added 2 tabs, 1 on each side of it. A tab on each side of the waist portion that snaps into notches on the torso portion, or vice versa. I really don’t care all too much about waist swivel. I got the set on Saturday and I just now opened it. I've only had the chance to check out Dai Atlas so far. I share everyone's dislike for the mechanism that makes the waist wobbly. Though it's at least slightly better than I was expecting. I was worried it was so wobbly it couldn't even be displayed. But it displays just fine. I still can't help but wish it had been designed better. I think it's so unsecure because their intention was to give him a hint of waist swivel. I couldn't care less about waist swivel. I'd rather the waist snap securely. None of the other nitpicks that bother other people matter to me. I can live with the hollow legs. I can live with the smaller face. It's only that waist that bothers me. I'm still glad I got it. 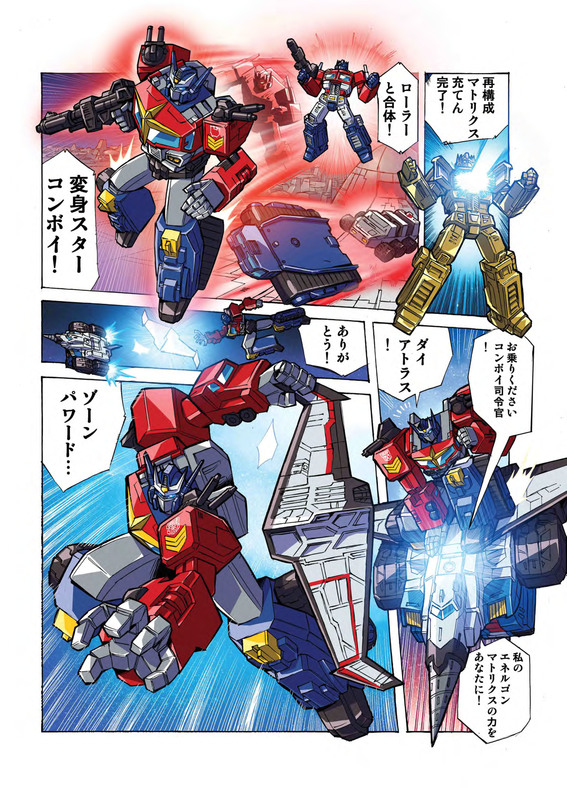 To anyone that has the set and the Jumpstarters, can Topspin combine with Roadfire and Twin Twist combine with Dai Atlas as per the comics included with the instructions in this set? Dat TR Overlord face on Dai Atlas.. so beautiful. 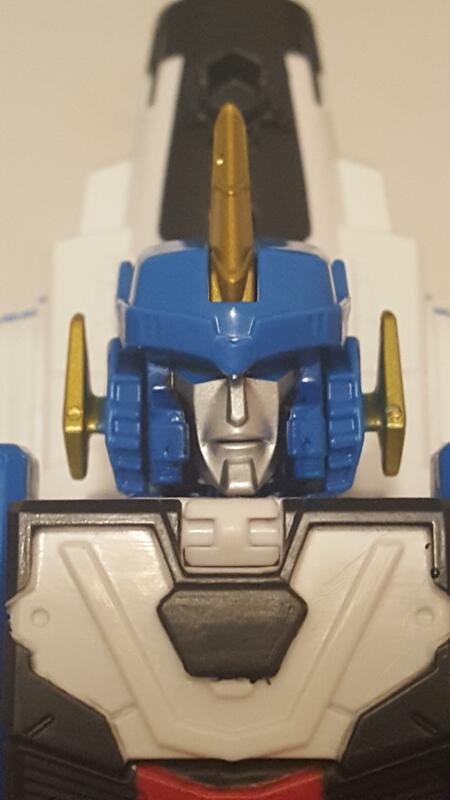 That huge chin is such a classic heroic robot face sculpt. Lmao. I got my Big Powered the other day but haven't had time to mess around with him. So glad i got him and hopefully this easter weekend I'll have more time to do so. So far from what i can tell these guys are awesome. Outdoor pictures are a lot better. 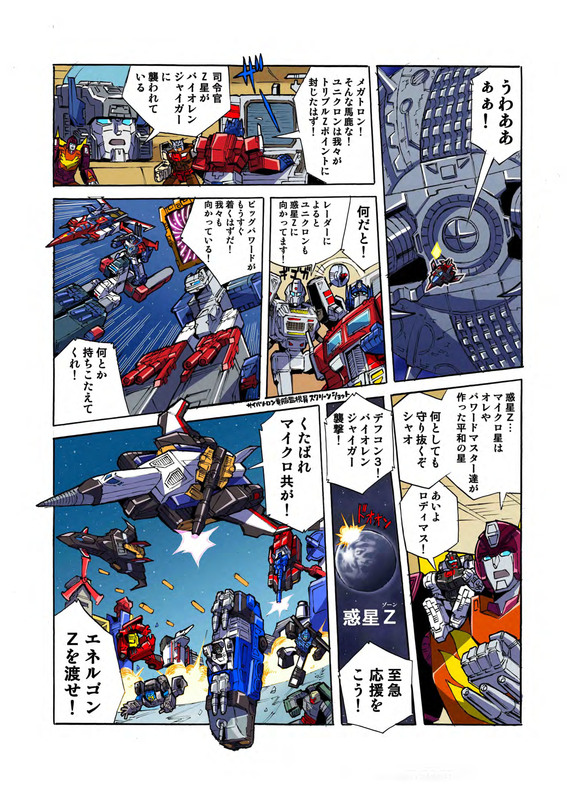 I recognize that there are some issues, but I find the characters fascinating (I always dig the more obscure ciphers) and it's not like I'll ever have their G1 toys. 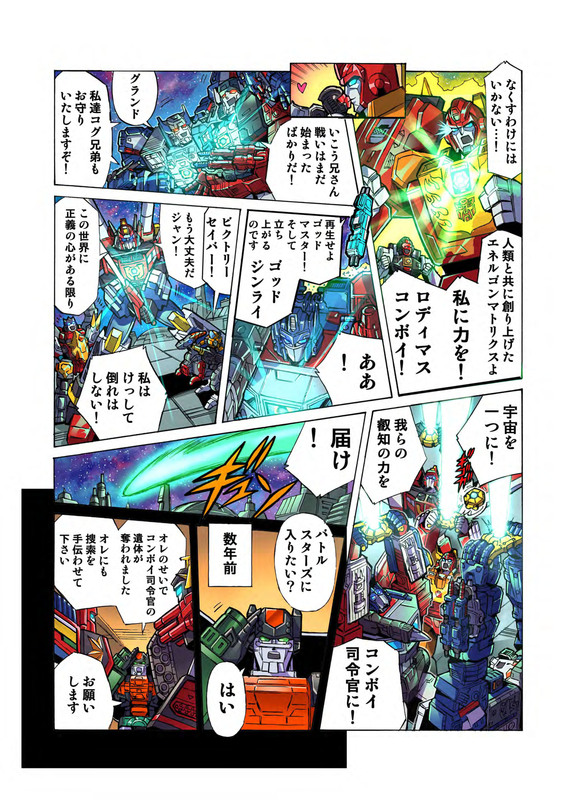 Plus I just adored Titanmasters… Are these toys perfect? Hell no. Am I glad I have them? HELL YES. Just opened these guys last night and I gotta say I'm pretty disappointed. Lots of QC issues with loose screws on the titan masters and floppy joints abound. The plastic quality on the new parts feel flimsy and a lot of sections don't tab in well, specifically Roadfire's waist and Dai Atlas' legs in vehicle mode. 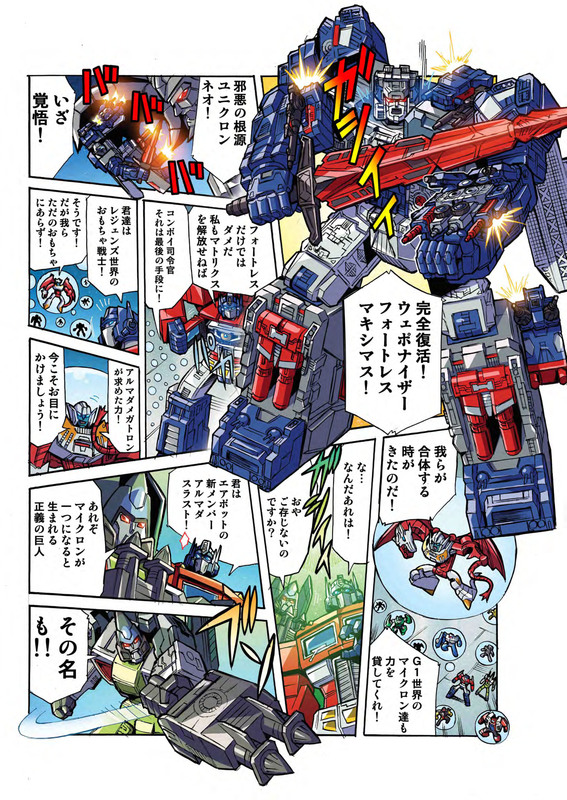 On a positive note the Big Powerd mode is more solid than I thought so good on that. Overall I just don't think this release is on par with the majority of the Legends line. At least it's better than the atrocity that was Godbomber! 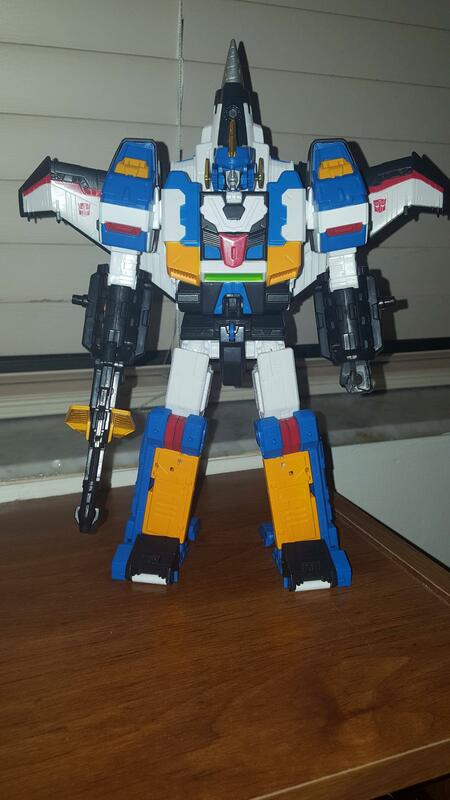 Finally got my Overlord in the mail and swapped out heads. Yeah that’s how it’s done. Be warned, it’s not the most stable as his arms become heavier and no longer are attached to the sides. 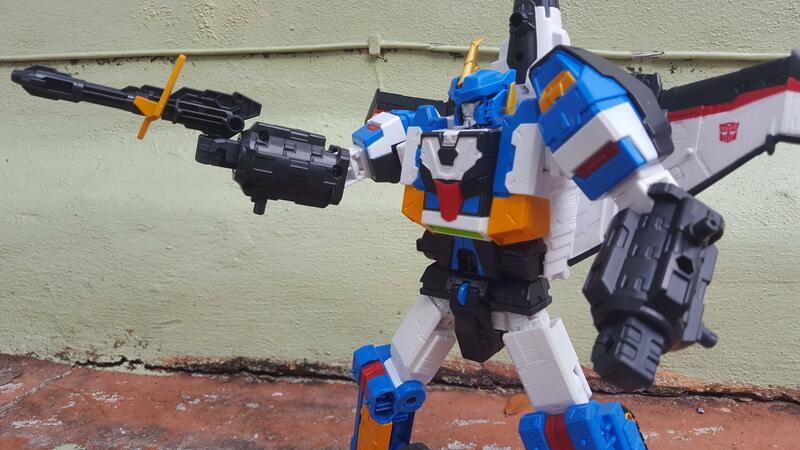 I’d love to find another way… I have some nonnef 90 degree adapters I might use..
Roadfire might be my favorite, if not for the gun (would have been great if gun somehow transformed to become less unwieldy). 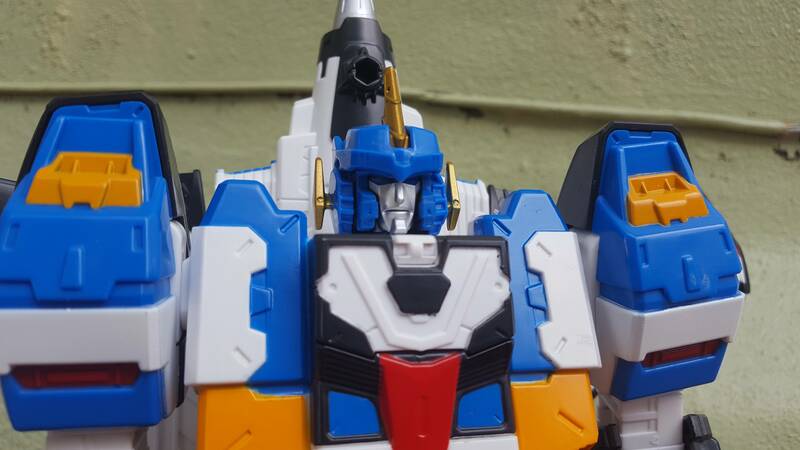 I've plugged Road Fire's big gun into his back and bent the barrel forward so it's pointing over his head. It reminds me of some sort of anti-aircraft gun. Also, it gives him a 'backpack' just like his buddies. But I still can't stand Dai Atlas's hollow legs. Got the trio today after they spent about 2 weeks in customs. I like them! They are much better than I expected, since my expectations were very low (khm Godbomber khm). Dai Atlas is pretty fun and doesn't look bad except for lower legs, and even they are not tragic. 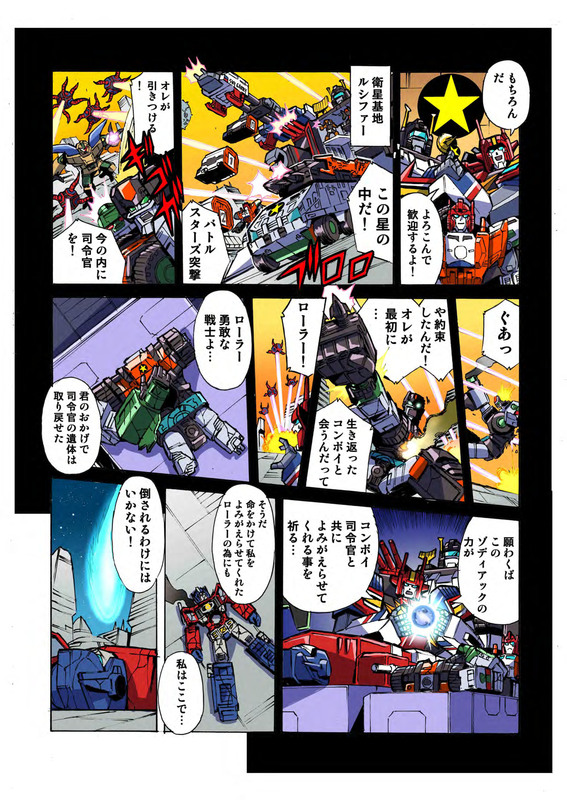 Roadfire might be my favorite, if not for the gun (would have been great if gun somehow transformed to become less unwieldy). 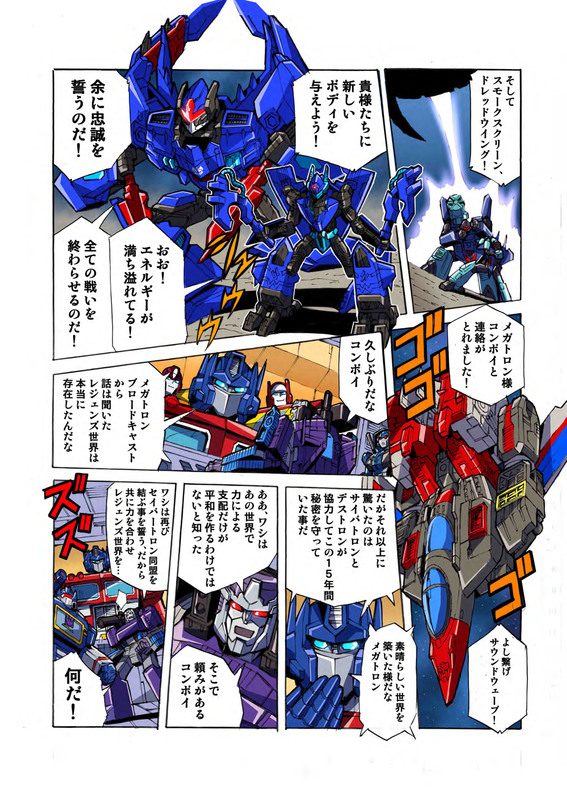 I haven't attempted the combined mode yet, but just wondering – is there an "official" combined robot mode, or just vehicles? Just a combined vehicle mode. 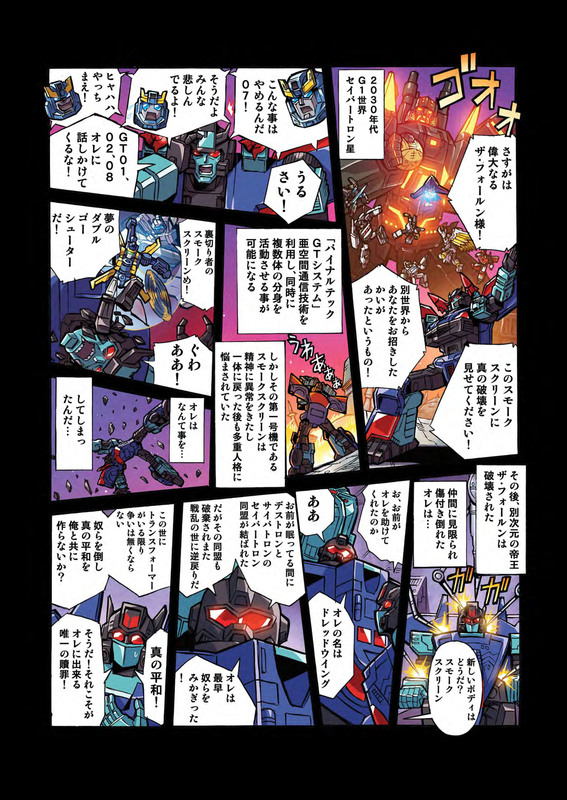 Unless someone can come up with a fan mode of them combined in bot mode. 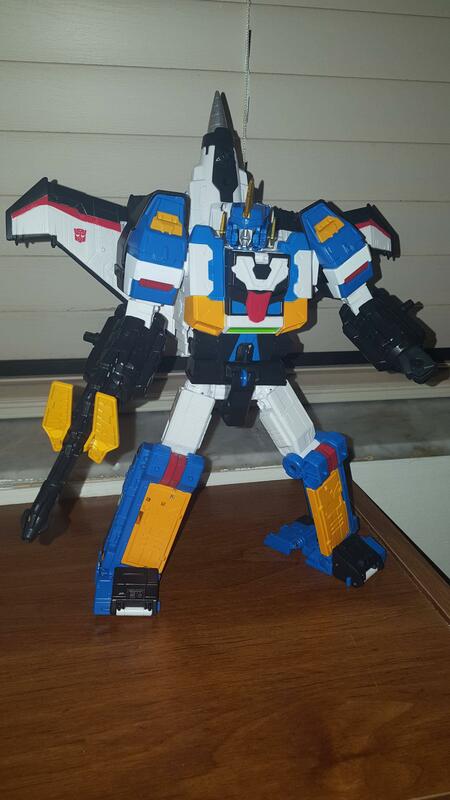 For what it's worth, the original Dai Atlas also required part-forming regarding the wings as well. So that is accurate.